The world’s top virology experts have watched the recent Hajj very closely, as has the world’s media since it first came on the scene in April 2012. It initially sprung up in Jordan but was soon exported to Saudi Arabia which has taken the hardest hit from the disease. As I write this blog 125 persons are confirmed to have caught the disease in the Kingdom, with 54 of them dying). 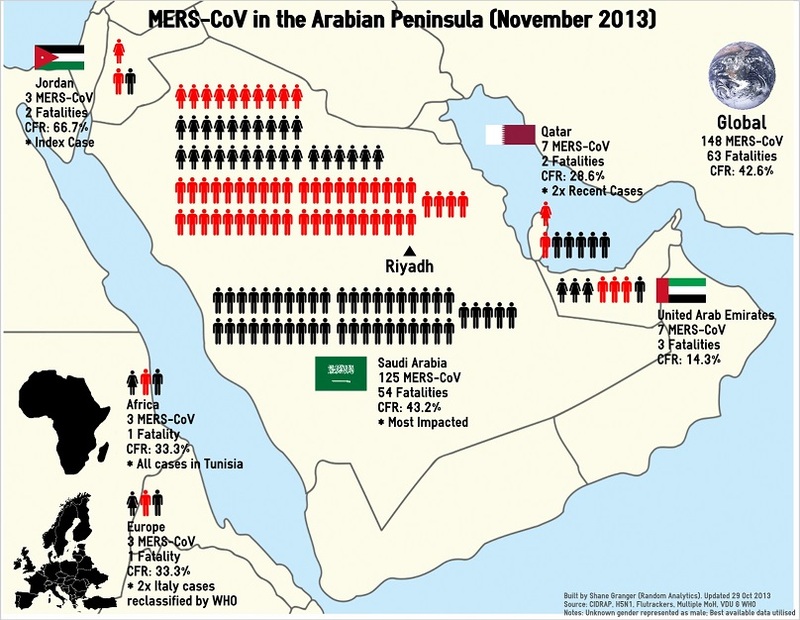 Of concern were the 2-million pilgrims who would be travelling together to the various sites (numbers were down approximately 1/3rd on recent years, possibly due to MERS-CoV). Although sometimes cramped the Hajj is generally well organised and supported including health and vaccination facilities. Some very good writers have expressed doubts about the data coming out of Saudi Arabia but the Hajj is behind us now. It seems that outside of some individual cases, as the possible French case highlights, major concerns about Saudi Arabia and the Hajj might have overblown. Perhaps those same concerns should be directed at Qatar and the conditions of those who are building the FIFA World Cup stadiums for 2022? Qatar has a population of just 1.9-million, of which only 15% are Qatari. In 2012, the country’s Gross Domestic Product per capita was the richest in the world at $89,736 (compare that to Australia $62,003, Canada $51,554, US $48,113, KSA $24,116 or Yemen $1,361). Yet a lot of the country is actually populated by very poor foreign workers who make up 94% of its total workforce. Recently The Guardian newspaper has highlighted the abject conditions of those working on construction sites. In the first article the International Trade Union Confederation has estimated that at current numbers the construction of FIFA World Cup facilities will cost around 4,000-lives mostly via heat related illness or workplace incidents, although the data is sketchy at best (and non-existent at worst). For those working and living in cramped filthy conditions or working long arduous days without proper food or hydration would be more at risk to just a seasonal flu. What about the practice of going to work when ill or ‘presenteeism’? How many of the 85% of non-Qatari’s in the monarchy have access to decent medical help. With 44 Nepalese dying in just 66-days and a further 82 Indians dying in the first five months of this year in work related incidents it seems trite to concern ourselves with a relatively small outbreak of a disease which only caused two deaths in 2013. 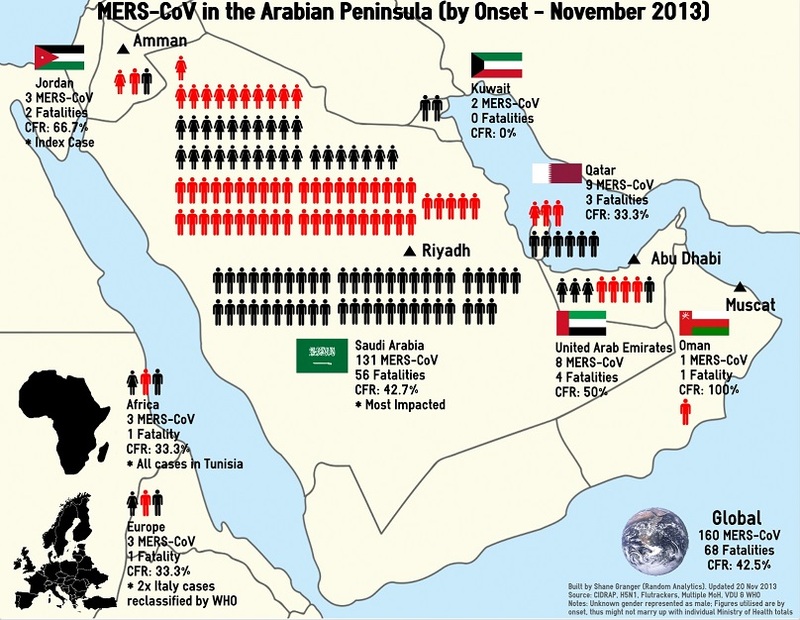 As I write this post in late October MERS-CoV has been confirmed in just seven cases in Qatar with two onsets in recent weeks. I’m not trying to suggest that all migrant workers in that country are going to get the virus it does seem a more likely vector than the better organised and supported Hajj pilgrimage.